Issue #120’s cover featured yet another bald alien race so I thought I’d get that out of the way right from the get-go. Much as I did with the instances of the Flash being shot into space, I’m going to stop pointing out the baldness factor. They’re pretty much all bald the rest of the way, gang. As I pulled the comic out of its plain brown wrapper (true factoid), I saw that the issue featured the first team-up between the Flash and Kid Flash, and that it was a book length story. 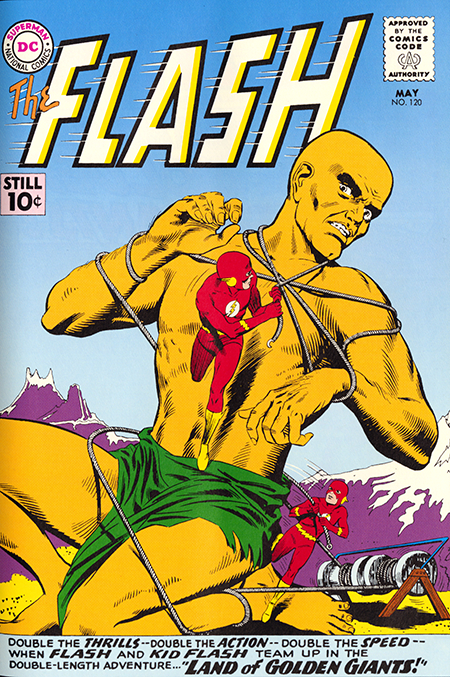 Those two factors made this a “very special” issue of the Flash. Book length stories were as rare as aliens with hair back then, and the team up of Barry and Wally definitely made it an event, but those weren’t the last of the surprises. The story is only on the third page when Barry reveals to Wally that he’s the Flash. He does this, one, “because it’s only fair”, and, two, because he’s scheduled to go on a scientific exploration cruise with his reporter girl friend Iris and her nephew Wally and he figures they might have to help each other out at some point during the voyage. The purpose of the expedition, led by a Doctor Manners, is to settle the question of continental drift. Once again, The Flash is presenting what amounted at the time to some cutting edge science regarding the fact that the continents had once been a single land mass and that the continents of South America and Africa had once been joined (although any twleve-year-old who had seen a globe had probably already deduced that on his or her own). When they make land fall in South America, a volcanic eruption and earthquake sends them back to the past to an age when the continents were joined. There the rouge runners (channelling the writer John Broome) encounter and subdue a race of gold color giants and, by creating the proper vibrations to simulate an earthquake, they send the exploration party back to the present (which interestingly is now way in the past). Dr. Manners proves the out the theory by taking a picture of an African lemur in South America and all ends happily including a shipboard romance between Wally and Dr. Manners daughter Gail. The story hit all of it’s marks and with a shot of the their ship sailing into the sunset wrapped up a very satisfying tale. On the Flash Grams page, Julie Schwartz awarded original Flash art to two letter writers, one of whom was Roy Thomas. Since I had already received my artwork from Julie, I was able to kick back with a certain equanimity and enjoy their good fortune rather than having my heart fill with bright green envy and jealously. Not only that, but the issue with my letter was coming up next. I’d have to keep my eyes peeled for that plain brown wrapper.